2:18 remember that hex pattern this morning? It said the market was working on 6th harmonic. 11:22 also note that the low came on the third Natural Time point. as price again popped up to square them; Market AstroPhysics in action. 10:16 if you have your speakers on, you heard the caht beeper, triggered by the hex pattern recognizer. and the Mercury/Sun combust, forming a nice 6th harmonic pattern, like snowflakes do. Nature loves the 6th. as descibed on the List of Charts -> Natural Times page. The high came on the first one. 9:43 my trade selection software looks at the MoonTide forecasts and selects 1, 2, or 3 Tide turns to trade. 4/18/2008 10:28:49 AM Mountain TG:: yes, Dr Al typo, should have been 14 not 13. 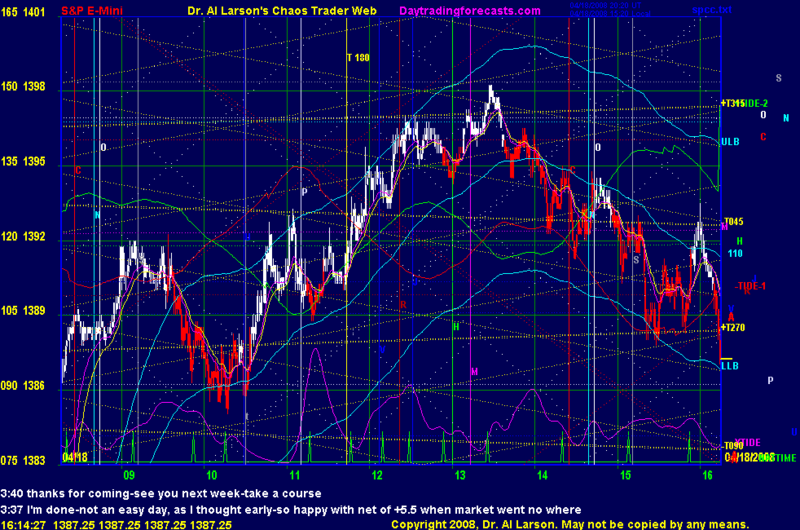 Actually I think the target using the method Al mentioned should be 1406.75 not 1409.75 but I may be wrong. 4/18/2008 9:48:08 AM Mountain gwd:: does the website have another chat room that is more active with traders posting their trades? 4/18/2008 7:24:11 AM Mountain TG:: 20 and 110 exmas would be used on a 1 minute bar chart. On a 3 minute you'd need to divide by 3 to approximate the same amount of time calculated in the exmas. Hence an exma of 7 on 3 minute bars is roughly equal to 20 on 1 minute bars and 36 or 37 on 3 minutes approximates 110 on 1 a 1 minute chart. 4/18/2008 6:48:10 AM Mountain gwd:: Also just to make sure I'm setting up my 20 and 110 ema's correctly...I have a 3 minute spx chart with the 20 and 110 ema displayed...this is correct right?